To Cite: Hassani V, Pazouki A, Nikoubakht N, Chaichian S, Sayarifard A, et al. The Effect of Gabapentin on Reducing Pain After Laparoscopic Gastric Bypass Surgery in Patients With Morbid Obesity: A Randomized Clinical Trial, Anesth Pain Med. 2015 ; 5(1):e61532. doi: 10.5812/aapm.22372. Background: Pain after laparoscopic gastric bypass surgery (LGBP) is a major problem. Gabapentin is an anticonvulsant drug that can be effective in postoperative pain control. Objectives: This study examined the effect of preoperative administration of gabapentin on reducing pain after LGBP in patients with morbid obesity. Patients and Methods: This randomized clinical trial was performed in Hazrat Rasoul Akram Medical Center in Tehran. A total of 60 patients undergoing LGBP were randomly allocated into two groups; one group received 100 mg of oral gabapentin and the other group received placebo. Pain was evaluated at recovery time, and at the first, second, fourth and sixth hour of surgery by visual analog scale. The number and dose of opioid use after surgery and incidence of postoperative complications, such as nausea and vomiting, agitation, and headache, were also recorded. Results: The mean pain score in the group receiving gabapentin was significantly lower than the placebo group (P < 0.001). Indications and dose of opioid consumption between the two groups were not statistically significant. Incidence of nausea/vomiting (P = 0.028) as well as agitation (P = 0.037) was significantly lower in the gabapentin group. Conclusions: Administration of gabapentin before surgery can reduce pain after LGBP. Furthermore, it is not accompanied by significant short-term adverse effects. Copyright © 2015, Iranian Society of Regional Anesthesia and Pain Medicine (ISRAPM).This is an open-access article distributed under the terms of the Creative Commons Attribution-NonCommercial 4.0 International License (http://creativecommons.org/licenses/by-nc/4.0/) which permits copy and redistribute the material just in noncommercial usages, provided the original work is properly cited. Morbid obesity is a pandemic disease and its prevalence, accompanied by a rapid increase, is higher in Iran than developed countries (1-5). Because it is accompanied by various diseases such as type II diabetes mellitus, hypertension, cardiovascular diseases, asthma, and sleep apnea, it leads to substantial economic and health costs (6). Today, laparoscopic Roux-en-Y gastric bypass surgery (LGBP) is used for weight loss and reducing the intolerable symptoms of obesity (7, 8). Among numerous postoperative complications, pain is the main adverse event experienced by patients. Good control of postoperative pain in patients is an important factor for reducing early postoperative complications such as pulmonary embolism, deep vein thrombosis, ileus, and respiratory infections, and for decreasing length of stay, lowering costs, and ultimately increasing patient satisfaction. Good control of postoperative pain after laparoscopic Roux-en-Y gastric bypass surgery is yet a challenging issue and a concern for anesthesiologists (9-11). Local anesthetics, paracetamol, nonsteroidal anti-inflammatory drugs, and intravenous morphine, patient-controlled analgesia pump are used in patients undergoing laparoscopic surgery for pain control (9). Gabapentin is a gamma-aminobutyric acid (GABA) analogue and its mechanism of actions are binding to the alpha-2 delta (α2-δ) subunit of the presynaptic voltage gated-calcium channels and inhibiting calcium release. It also has interaction with N-methyl-D-aspartate (NMDA) receptor and causes reduction in substance P and glutamate, which has preventive effects on central nervous system excitability by this mechanism (12). Thus, several studies have been conducted to determine the efficacy of gabapentin in treatment of pain after surgery and assessing the role of gabapentinoids as an analgesic in acute pain control is in progress (13-15). Considering the need for postoperative pain control in surgical procedures, which reduces hospital stay as well as complications induced by opioid drugs and anesthesia. The current study investigated the effect of administrating 100 mg of gabapentin as premedication in reducing postoperative pain of patients with morbid obesity undergoing LGBP surgery. This study was conducted as a double-blind randomized clinical trial recruiting 18 to 65 year old individuals who underwent LGBP surgery. We estimated the sample size for the primary outcome (pain score) based on the results from our pilot study (n = 10), which showed a mean reduction of 1.3 with standard deviation (SD) of 1.5 in pain score, using visual analog scale (VAS). Given an alpha error of 0.05, power of 90% was estimated, and sample size was decided at 60. Samples were selected by convenient sampling method from patients with morbid obesity referred to Hazrat Rasul Hospital during 2012-2013. Informed consent was obtained from participants. Inclusion criteria included candidates for the LGBP surgery, age > 18 years, ASA class II or I, morbid obesity (body mass index [BMI] ≥ 40 kg/m2). Exclusion criteria included one or more of the following: cardiovascular and respiratory diseases, frequent headaches, dizziness, drug and/or alcohol abuse, use of daily analgesia 48 hours before the surgery, renal failure, and liver dysfunction. Patients were randomly allocated into two groups of gabapentin and placebo, each with sample size of 30 using four-block randomization. Gabapentin group received 100 mg of oral gabapentin and placebo group received identical-to-gabapentin placebo capsules one hour before induction of anesthesia. Both patient and the anesthesiologist, who evaluated pain and drug complications, were not aware of the type of the drugs received by each participant. Induction was performed with 2 mg of intravenous (IV) midazolam hydrochloride, 5 mg/kg of IV thiopental, 0.5 mg/kg of IV atracurium besylate, and 3 μg/kg of IV fentanyl. Patients were intubated and mechanically ventilated. Fentanyl (1 µg/kg) was repeated at 30 minute to maintain general anesthesia. Patients were monitored and kept under maintenance dose of 100 μg/kg per minute of IV propofol and atracurium during the surgery. The night before and the morning after the surgery, all patients were treated with 150 mg of oral ranitidine and 10 mg of oral oxazepam as premedication. In the operating room, a 10-mg capsule of gabapentin was given to gabapentin group and placebo capsule to controls. Patients underwent standard monitoring including electrocardiogram, pulse oximetry, and blood pressure measuring. Patients were hydrated with infusion of 5 mL/kg of 0.9% saline. Calculation of blood transfusions and fluid therapy were performed using standard methods. Pain severity was measured by VAS in recovery room, and at first, second, fourth, and sixth hour of surgery. If the pain score was > 4, analgesia (IV narcotic opiates) was administered. Number of opioid consumption (analgesic) and doses were registered. Sedation score was recorded using Pasero Opioid-induced Sedation Scale (POSS) (16). 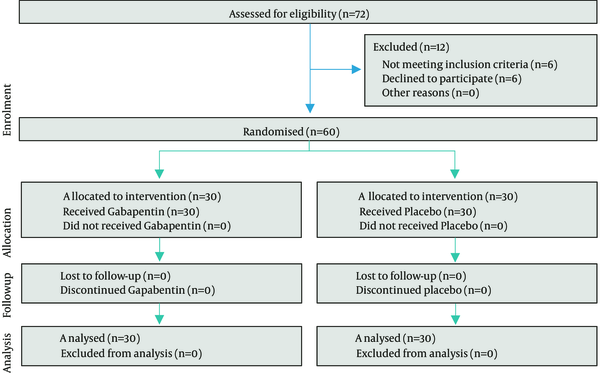 Incidence of the most common side effects of gabapentin including headache, agitation, dizziness, blurred vision, and other symptoms such as nausea and vomiting were evaluated during the study. Demographic data, pain and medication complications, and other information were obtained by a designed data form. The collected data were analyzed using SPSS 11.5 (SPSS Inc, Chicago, Illinois, the United States). Frequency for qualitative variables and mean and SD for the quantitative variables were calculated. Kolmogorov–Smirnov test was used to check the normality of the data distribution. Qualitative data analysis was performed using Chi square or Fisher exact test. Quantitative data analysis was performed using Student’s t test or Mann-Whitney U test and Repeated Measures ANOVA. P value < 0.05 was considered statistically significant in all statistical analyses. This study conformed to the Helsinki Declaration ethical principles. The study was derived from Dr. N. Nikobakht’s postgraduate thesis, supervised by Prof. V. Hassani, entitled “Assessing the effect of preoperational administration of gabapentin on postoperative pain of patients with morbid obesity, undergoing laparoscopic gastric bypass surgery”. The study protocol was approved by the ethics committee of Iran University of Medical Sciences and recorded in IRCT Center (code, IRCT201405318588N19). We examined 76 patients using the inclusion criteria. Twelve patients were ineligible for the study because of history of coronary artery diseases (n = 4), BMI < 40 kg/m2 (n = 2), and refusal to participate (n = 6). A total of 60 patients met the criteria and were randomly allocated to two groups of 30 (Figure 1). Totally, 33 patients (55%) were female and 27 (45%) were male. Mean age of patients was 34.3 ± 7.6 years (range, 24-60 years). Demographic data of patients as well as the surgery duration are given in Table 1. Two groups were homogenous in demographic data. (Table 1) Sedation scores in the case and control groups were respectively two and three. 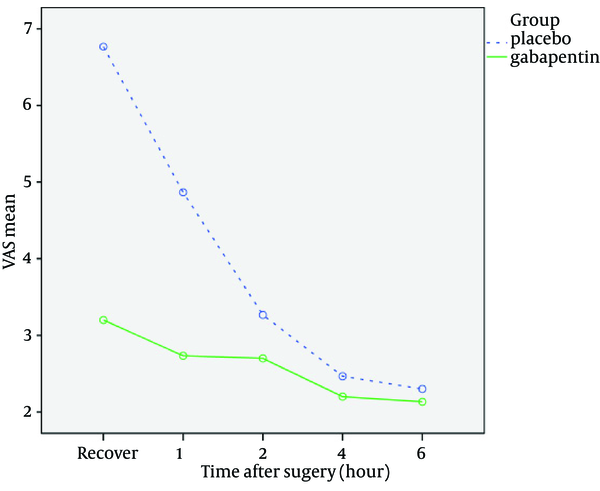 Mean pain score in recovery and at first, second, fourth, and sixth hour of surgery was lower in the gabapentin group compared to the placebo group (Figure 2). Mean pain score in recovery (P < 0.001) and at first (P < 0.001), second (P = 0.007), and fourth (P=0.04) hour of surgery was significantly lower in the gabapentin group compared to placebo group (Table 2). Mean pain score at sixth hour of surgery was lower in the gabapentin than was in placebo group, but it was not statistically significant (P = 0.1) (Table 2). The number of patients who needed opioid was lower in the gabapentin group than was in controls (P = 0.058) (Table 3); however, no statistically significant difference was observed among the patients who had received opioids. Opioid dose was lower in gabapentin group, but the difference was not statistically significant (P = 0.08) (Table 3). The number of patients with side effects including nausea/vomiting (P = 0.028) and agitation (P = 0.037) were significantly lower in the group receiving gabapentin than in the control group. Nonetheless, there was no significant difference between two groups regarding the number of patients experiencing headache (P = 0.3). aData are presented as Mean ± SD or No. Abbreviation: VAS, visual analog scale. aAbbreviation: VAS, visual analog scale. bData presented as Mean ± SD. aData presented as Mean ± SD or No. (%). This study showed that administration of gabapentin before surgery could reduce post-LGBP pain. Gabapentin has anticonvulsant, antianxiety, and sedative effects and is used for the management of postoperative pain due to its antihyperalgesic properties (17-19). The present study revealed that the mean of pain score was lower in those receiving gabapentin than in the control group (P < 0.001). These findings were similar to Lee et al. study on thyroid surgery and Ajori et al. study on hysterectomies, which concluded that administration of 600 mg of gabapentin would reduce pain before surgery (20, 21). Panah Khahi et al. also concluded that administration of 300 mg of gabapentin two hours before the internal fixation of tibia could reduce postoperative pain (22). Moreover, a study by Ture et al. concluded that gabapentin was effective in reducing postoperative pain and might increase sedation and delay the patient’s extubation in those undergoing craniotomy (23). In addition, findings from the current study confirmed the results of two meta-analyses by Dauri et al. and Hurley et al. reporting that compared to other analgesic drugs, preoperative administration of gabapentin was applicable for postoperative pain management with different mechanisms of analgesia (24, 25). On the other hand, the study by Dierking et al. showed that a total dose of 3000 mg gabapentin before and within 24 hours of surgery had no significant effect on postoperative pain score, but reduced postoperative morphine consumption after hysterectomy surgery (26). In our study, postoperative opioid consumption was lower in the group receiving gabapentin, but this difference was not statistically significant; however, it was expected that the need for opioids would be reduced with pain reduction. Yet opioid consumption might vary based on differences in the type and severity of postoperative pain and type of surgical procedures. In this study the incidence of nausea/vomiting and agitation was significantly lower in the case group (receiving gabapentin), which could be due to better pain control in gabapentin group. Clivatti et al. investigated 26 randomized clinical trials conducted from 2005 to 2007 to assess the effects of gabapentin administration before and after surgery. Some of the above studies showed reduced incidence of nausea and vomiting after surgery while others showed increased incidence of these complications (27). A study by Turan et al. showed that patients who received 1200 mg of gabapentin in spinal surgery experienced no adverse effects (28). Another study concluded that in comparison with the placebo group, the incidence of nausea and vomiting in patients who had received gabapentin before elective hysterectomy was not significant (29). Dauri et al. showed that gabapentin had no preventive effect on postoperative nausea and vomiting (25). Single-dose administration of 100-mg gabapentin before surgery can reduce pain without significant short-term adverse effects after LGBP surgery. The authors wish to acknowledge the contribution of all participating team members who helped us in this project. Funding/Support: The study was supported Iran University of Medical Sciences, by the grant number 92-01-140-21647.